"Have you enjoyed all the Finnish bands tonight? Are you ready for some mosh pitting?" 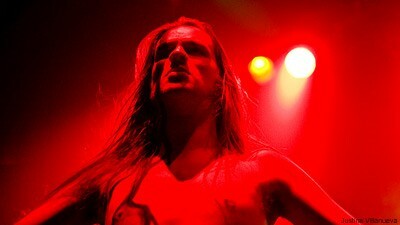 Finntroll frontman Vreth asked the people of Gramercy Theater on April 8. The band's New York City stop was the third of a full U.S. tour the band has embarked on. Finntroll -- along with other bands on the American tour, Moonsorrow and Swallow the Sun -- had the pleasure of playing Norway's Inferno Festival just before arriving in the states. I think the power of that festival added some extra enthusiasm to the Finnish band's New York set. That and of course the crazed New York fans were having (almost) too much fun with all their "mosh pitting." The not-so-troll-looking men play a Finnish folk brand of black metal. But with poppy keyboard parts, it was like watching a less friendly, less instructive Andrew W.K. show -- which is a good thing in Noisecreep's book. Oh, and they were a lot like Australian metallers the Amenta -- who played Gramercy Theater just last winter with Vader. Finntroll, Moonsorrow and Swallow the Sun end their North American tour on May 1 in Fort Worth, Texas. Be sure to check out Finntroll's 'Nifelvind,' which is out everywhere via Century Media. You can also catch the band at this year's Hellfest in France on June 18.